Tektronix, Inc., the world's leading manufacturer of oscilloscopes, recently announced automated test software for Serial Attached SCSI (SAS) physical-layer transmitter conformance testing that now includes measurement support for SAS-3 12 Gbps interfaces. 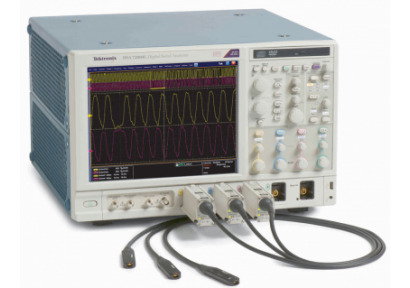 Using DPO/DSA/MSO70000 Series oscilloscopes with real time sampling rates up to 100 GS/s on two channels at 33 GHz bandwidth along with DPOJET-based automated conformance test software engineers can gain deep insights into critical SAS-3 design challenges. SAS is a high-speed serial bus widely used in high-end server and workstation storage applications. With SAS-3, data rates doubling to 12 Gbps from the 6 Gbps used in SAS-2 interfaces today. Storage devices and chipsets operating at 12 Gbps introduce tough new electrical design challenges, such as crosstalk or reduced signal-to-noise ratio that previously could be ignored or resolved relatively easily. Early adopters trying to reduce time to market need tools that simplify the task of making SAS-3 12 Gbps transmitter measurements. With the combination of automated software and accompanying Transmitter and Receiver Test method of implementation (MOI) documents, Tektronix gives SAS-3 designers a complete PHY-layer transmitter test solution that makes measurements easier and helps them quickly gain needed domain expertise to understand and interpret test results. "As the speeds increase - in the case of SAS doubling from one generation to the next - automated test solutions becomes increasingly important to meet narrow time-to-market windows," said Brian Reich, general manager, Performance Oscilloscopes, Tektronix. "By working closely with the SAS working group and participating in plugfests, we are able to quickly extend our SAS solution set to support the latest standard." The Tektronix SAS-3 solution supports measurement of PHY design characteristics beyond traditional AC parametric measurements to include crosstalk and equalization analysis along with an integrated end-to-end simulation toolset. The automation software also allows designers to easily troubleshoot design issues using DPOJET jitter and eye-diagram analysis tools. Users can also leverage custom configuration capabilities to modify test parameters or add plots such as trend or histograms to gain further insights. DPO/DSA/MSO70000 Series oscilloscopes deliver exceptional signal acquisition performance and analysis capability, allowing designers to capture more signal detail with one of the industry's highest sample rate capability. They feature automated setup for acquisition and analysis of high-speed serial data signals with a toolset engineered to deliver faster design and compliance testing. The SAS-3 automated transmitter test solution for 12 Gbps interfaces is available now worldwide.